People born under the Cancer sun are naturally maternal and domestic. This family-oriented zodiac sign is passionate, sympathetic, understanding, and nurturing. Most Cancer people are conservative and nostalgic. They are sentimental and represent emotional security. 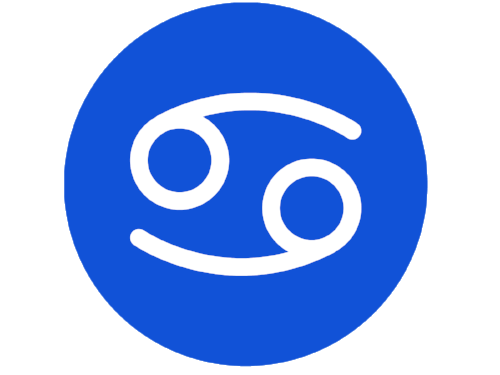 Cancer is a water sign that is highly intuitive, imaginative, dreamy, and artistic. Gemstones for the zodiac sign of Cancer include: Amethyst, Agate, Aventurine, Moonstone, Jasper, Chalcedony, Cat’s Eye, and Turquoise. Those born under the zodiac sign of Cancer are nurturing, protective, and creative. This sign is loyal, compassionate, and empathetic. Rose Quartz is a wonderful gemstone that promotes peace, unconditional love, harmony, and self care. This pink crystal heightens trust, personal fulfillment, and understanding. Open your heart and allow love to flow with these natural soothing gems. Use this Rose Quartz jewelry set to promote self-love, inner-guidance, and encourage emotional healing. This gemstone zodiac set includes: Natural Rose Quartz pendant with 18” black leather necklace, (2) Rose Quartz Pocket Stones, and (1) Rose Quartz (Grace) Lanyard Charm (perfect for keychain or cell phone case). People born under the Cancer Sun are loving, caring, and nurturing. This zodiac sign is unpredictable, intuitive, and loyal. Gray Agate promotes peace, harmony, and stability. These natural healing gems bring inner-strength, improve communication, and help clarify perception. Cancerians benefit with Gray Agate by strengthening their structure, stimulating courage, and building self-esteem. Get grounded feel stabilized with this gray agate jewelry set! This gemstone zodiac set includes: Natural Gray Agate pendant with 18” black leather necklace, (2) Gray Agate Pocket Stones, and (1) Gray Agate Lanyard Charm (perfect for keychain or cell phone case). Cancer leather tie bracelet with Agate gemstone. Agate is a “Stone of Strength, Stability, Composure, and Self-Confidence.” This gemstone gently transforms negative energy and brings emotions into harmony, it helps control unnecessary desires and promotes self-acceptance. For Cancerians, Agate awakens a sense of reality, this natural healing gem helps overcome bitterness and gives courage for new beginnings. 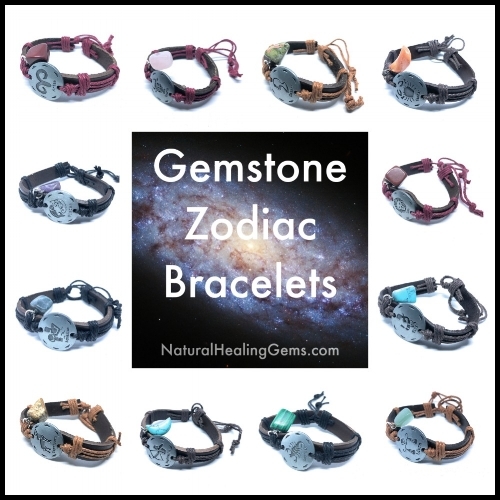 Stabilize and strengthen with this zodiac gemstone bracelet. Real Leather tie bracelet with natural gemstone. Measures 7” with adjustable tie. Are you ready for some positive transformations? Malachite empowers, protects, purifies, and attracts. This vibrant green gemstone alleviates shyness and encourages risk taking. It brings protection from negative energy, purifies the atmosphere, and attracts abundance of all sorts. Get ready to change your lifestyle and attract positive vibes with this powerful green gemstone necklace. Malachite Heart Gemstone Necklace with 18” silver link chain. Strengthen and protect your heart with this natural Malachite necklace! This powerful green gemstone creates a layer of protection from outer influences, it establishes inner-strength and encourages positive lifestyle changes. Be Brave and FOLLOW YOUR HEART with this green gemstone heart necklace! Moonstone is known as "The Travelers Stone." These gemstones encourage a positive mood while traveling. They bring protection from unwanted energy (such as jet lag and road rage). Moonstone elevates your spirit and promotes guidance, peace, adventure, and good fortune. Keep these mystical stones with you to calm nerves and encourage exploration. Expect safe travels when you carry Moonstone!